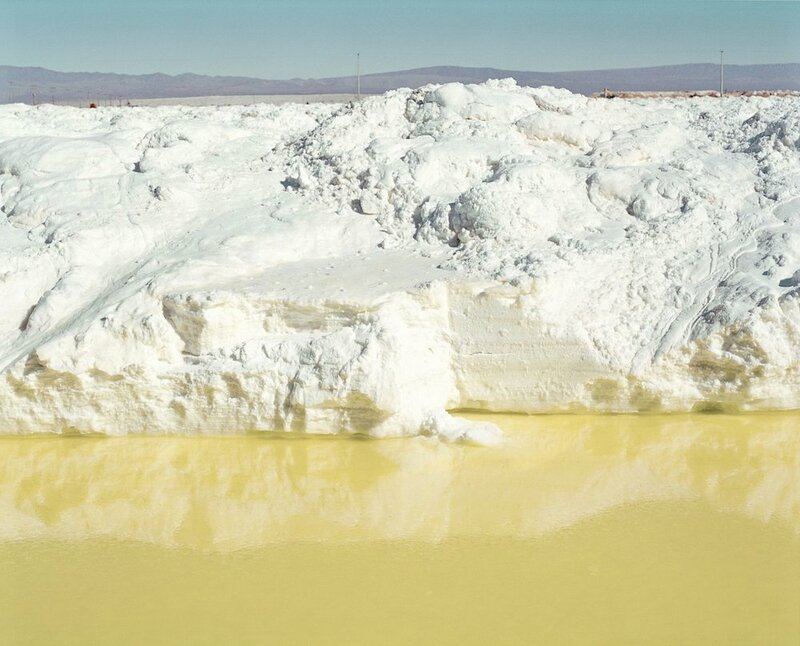 London-based photographer Catherine Hyland traveled to the salt flats of the Atacama Desert in Chile to DOCUMENT the environmentally contentious production of lithium – a metal powering today’s modern world. 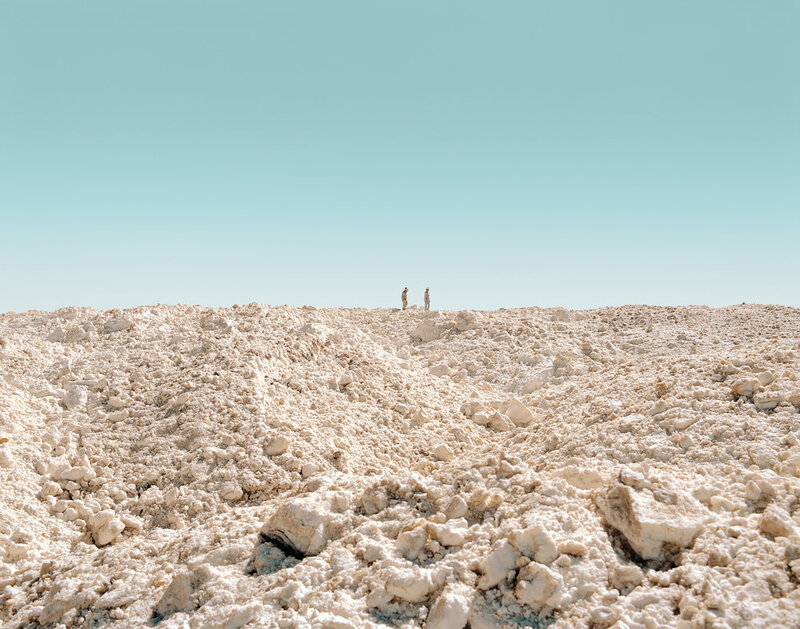 Such is the picture in Catherine Hyland’s series of images from the SQM mine in the Atacama desert in northern Chile. The Atacama is famous for being the world’s driest place. Four thousand metres above sea level in the rain shadow of the Andes Mountains, almost no rain falls here and the people who do live here have historically scraped a living breeding llamas and goats or knitting hats. So it’s remote and isolated. It’s also the world’s largest source of lithium, home to minerals that provide the power that fuels our modern daily life. Break down a smartphone battery and you’ll find three grams of lithium inside. A laptop has around seventy grams. Move up to an electric car and you’ll find twenty kilograms. Lithium is the element of the moment and the Atacama is where most of it comes from. One side of the story that Hyland tells with her images is the process of making this lithium. In the Salar de Atacama salt flat, lithium exists as a mineral salt suspended in underground reservoirs of brine. To get sufficient concentration of lithium, the brine is pumped into evaporation ponds and then goes through repeated cycles of solar evaporation. That’s where the color comes from, the blues, the greens, the yellow, the deepening shades signifying the higher concentrations being reached for the final collection of lithium salts that are then processed further into the metal that will go into your smartphone battery. That process is evident in landscapes that show the flatness of the evaporation ponds, the crust-like surface of the earth, the idea of isolation and fragility even in the gullies and villages that dot the region. 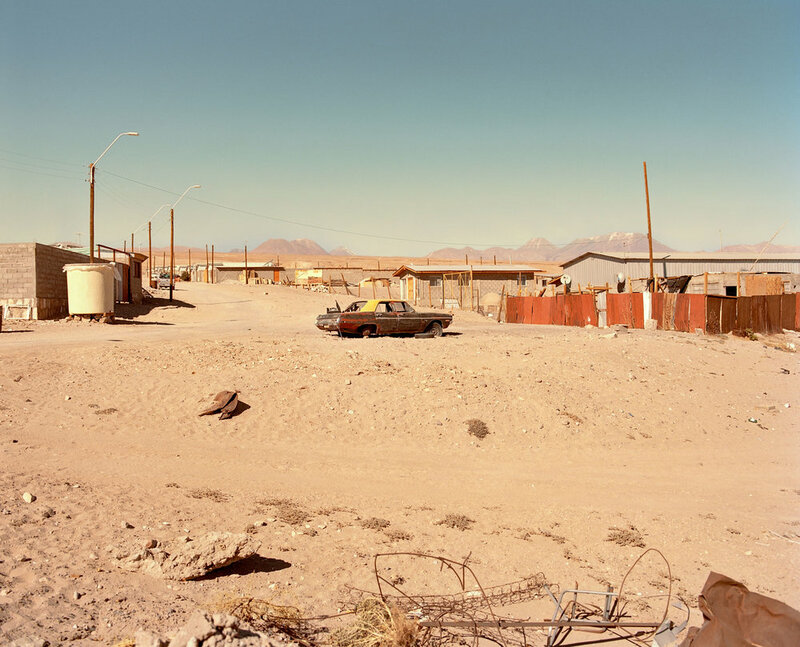 As in her previous work in China, Universal Experience, Hyland captures a world that seems empty and desolate. Embedded in these images are the attempts of man to tame the land and to control it. The dusty roads, the two square miles of neatly bordered pools put the land into a grid. There is the idea that this is a desolate place that has been made tidy by mining. This idea of taming the landscape, of economically productive order coming out of this unpopulated wilderness is one that suits a particular narrative. It’s also an idea that has precedence in mapping of the landscape. From Timothy O’Sullivan’s King’s Survey pictures of the American West to nineteenth century maps detailing the division of Africa between the colonial powers of Europe; you can see the idea of emptiness and absence being used to justify expansionism, colonialism and control. Make something empty and people see it as empty. And if it’s empty who cares what you do to it. It’s yours for the taking. But there are other hints at human habitation here too; a gully running past a village showing both that rain does fall here sometimes and that the area is inhabited, albeit sparsely. There are dried up salt ponds, deserted cars and strung out telephone cables. The dilemma for the Atacama people is how to live on a land that, already the driest place on the planet and in the midst of a four-year drought, is seeing its water resources further depleted without much idea of the long-term consequences. It’s a dilemma compounded by the fact that communities are divided between those who make a decent wage from the jobs provided by the mining companies, and those concerned at the slow destruction of a very fragile environment, and with it the ending of a way of life that has endured for hundreds of years. And that’s what Hyland’s landscapes hint at; a land taken over by this sudden boom in a lithium trade that fuels our digitally dominated lives, but with an undercurrent that this boom is transient, that there are longer running narratives, both human and geological, at play. There is enough lithium in the Atacama to make batteries for 400 million electric cars, but taking the long view, that’s not very many. We will consume, the cars will come and go, the lithium will run out, the mines will close, the land will remain.